Through the use of quality materials, fine craftsmanship and a variety of exclusive features, this carriage has become the standard of the industry. 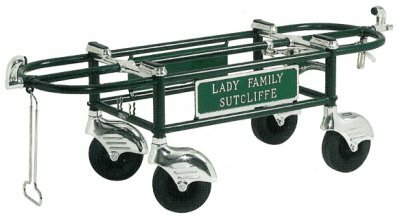 Mobile stand and casket carriage with tow bar, and long channels. Adds one-third longer life to lowering device. Ideal mobile stand for fast, simple graveside set-ups.Provides mobile, compact unit of stand, lowering device, placer, & drapes. Everything on wheels ready to use.Easily maneuvered between cemetery ornaments and into tight places. Virtually eliminates set-ups and knockdowns. 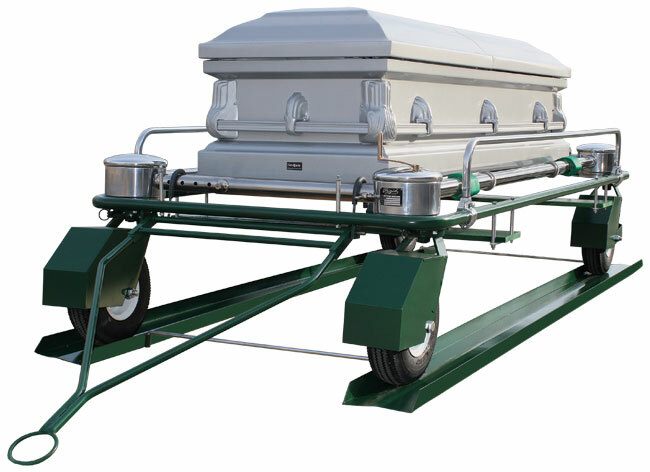 Provides safe mobile casket handling from hearse to the grave. This provides pallbearers with a dependable method of moving the casket from hearse to graveside without incident or mishap. Heavy-duty frame of 1-1/2" - 14-gauge welded steel tubing with extra-large pneumatic wheels.